Formula 1, street racing, motorcycles, all-terrain vehicles, jet skis, even snowmobiles - think of a motorised vehicle and it's likely been raced on iPhone and iPod touch. Set in a post-apocalyptic world of scorching wastelands and nuclear winter, Race After 1977 will provide hours of fun as you race against your opponents, sliding through sand and ice, slamming opponents out of the way, and jumping onto walls to seize the advantage. Race After 1977 takes a different approach, focusing on the setting instead of the vehicles themselves. 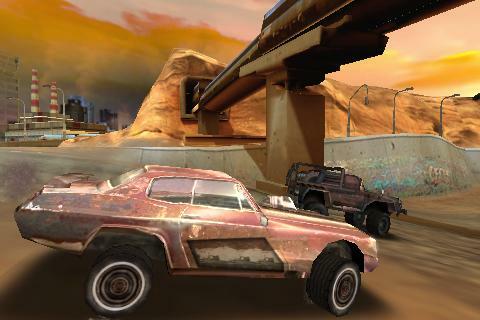 Opting for a post-apocalyptic stage in which the planet's surface has been ravaged by nuclear blasts and the ensuing fallout, you race to the death in intense competitions between those fortunate enough to have cars. Developer Xpect Games promises an in-depth Story mode packed with tournaments that flesh out competition between rival post-war factions. 1970s-era trucks, muscle cars, and classic sedans will be available to race in various locales such as dilapidated New York, Denver, Seattle, Los Angeles, and San Francisco. While multiplayer isn't mentioned on the game's official website, hopefully at least local play via Bluetooth or wi-fi is supported. Multiplayer would be ideal. Race After 1977 will be available for iPhone and iPod touch some time this autumn.